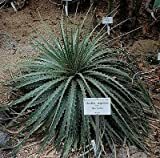 Hechtia growing leaf plant bromeliads of the genus Hechtia also known as Bakerantha, Hechtia perennial evergreen used as ornamental plant, can grow in subtropics, mediterranean or tropic climate and growing in hardiness zone 10b+. 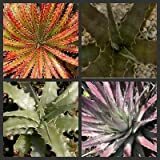 Leaves color green, red, purple, yellow, gray, leaf linear with spines and sharp in the edge, leaves grow in rosette structure. Flower color white or red, the flowers grow in the inner part of the plant, male and female flowers on separate plants.